Its a busy week here for me, so the update was somewhat delayed. Sorry about that. Michael wanted me to pass along that his first Haiku of Horror has been selling very well and he wants to thank all who supported it. Likewise, he's planning further releases in the line and would like to know what you would like. There is a castle setting planned, but it won't be the next release. Oniba, the chief province of Yonshu, is a verdant region of thick forests and fertile river valleys. 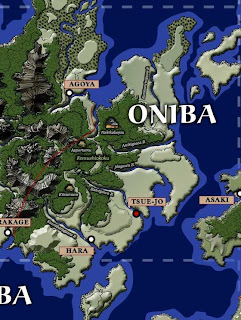 The most heavily populated of the four Yonshu provinces, Oniba has profited greatly from the increased commerce in nearby Gaijinoshima, whilst simultaneously managing to keep itself mostly unsullied from gaijin influence. Farming communities are plentiful along the many streams and rivers, and logging continues to thrive north of the Anikigawa. As one heads further west into the province, into the foothills of the mountains of Gaijinaba, the forests become thicker and darker. The Kaidanese seldom venture into these mountain woods, for they are full of yokai and other dangers. Cedar, oak, pine, together with elms and beeches, fill the woods of Oniba. To the south, mulberry is common, having been cultivated and encouraged by the silk farmers of the province. Other cultivated trees include nashi, kaki and peach trees. Bamboo is also plentiful. In the wooded region of the three brothers, there are numerous stands of giant bamboo The grasslands east of the forests is filled with smaller bamboo, a variety of small shrub plants, such as willow shrubs and privet, and a variety of grasses, of which susuki is the most common. Black bears are common in the northern forests of oniba, though they are also seen sometimes in the south. Boar are also common, and dire boar can be found near the mountains. Some of the dire boar are thought to be intelligent by the yokai, and they do not hunt these animals. Wolves, of the smaller Anshu variety, are rare but not unknown in the forests. Spotted deer are plentiful, especially, in the northern forests and grasslands. Smaller mammals include rabbits, squirrels, martens, otters, and fox. Along the north-east coast of Oniba, one can sometimes see seals, especially in the winter. A variety of songbirds can be found in both the woods and the river-valleys. Black cranes, from the marshes of Gaijinaba, are sometimes seen also in Oniba, especially in the late spring and summer. Hawks, owls and sparrowhawks are common, as are, along the coast, gulls and albatross. In the deep woods, enclaves of giant spiders are a known danger. There seem to be very few poisonous snakes in Oniba, though there is a species of blue-banded, black-headed sea snakes which fishermen know to either avoid or kill on sight because of their toxicity. Green rat snakes are common, as are other small serpents such as keelbacks and oddtooth snakes. Oniba is one of only two Kaidanese provinces which has no mountains of note (the other being Hatsuko on Anshu), though the eastern foothills of the Gaijinaba mountains begin within the province. Oniba is full of rivers and streams. The three large rivers flowing through the center of the province are known collectively as the three brothers and Kaidanese legends say that they were formed by the spirits of the first three men who settled on Yonshu, Though the yokai dismiss this claim, saying that the rivers were formed by the souls of three yokai who swore allegiance to one another and to the land. The northernmost of the three river is the Anikigawa, the second is the Jikigawa and the third is theBatteigawa. The land between the Anikigawa and the Jikigawa is full of marshes and is known provincially as Komushioukoku, “The Kingdom of the Flies.” The Batteigawa is the slowest of the three rivers and Tsue-jo, the provincial capital, is build on a river island in the midst of it. South of three brothers is the Kuwabara-gawa,named for the many mulberry-silk plantations along its length. To the north, theKurotsuru'no-gawa flows northward. This river is named for the black cranes which nest along its length in the summer, though these cranes winter to the north-west, in the marshes of Gaihinaba. Oniba is the oldest of the Yonshu provinces, being the first of the regions subdued by the Shogun on the island, However, Lord Hachiwara no Otsuka has served as Daimyo of Oniba for only three hundred ten years. Prior to this, he had oversight of Hamato province and his success there prompted the Shogun to send Him to serve in Oniba, for there had been, to that point, continued rebellion in Taro and Oniba alike. Lord Hachiwara acted decisively to quell the rebellion and established order over all those parts of the island easily reached by Samurai. He repaired the main roads of the island and then began working to improve the economy. His success has been noteworthy, though his methods are brutal, cruel, and manipulative. Hachiwara is one of the most conniving and far thinking of all the Daimyo of Kaidan and he maintains contingency plans for nearly every undertaking and possibility, including the fall of the Kaidanese empire. Those who cross him can rest assured that their downfall is only a matter of time, and that their end will be unpleasant. Oniba serves as the chief province of Yonshu, and records of nearly everything of note on the island, including births and deaths of all samurai (though not peasants or eta-hinin), are meticulously kept. Likewise, in keeping with the attitude of the daimyo, the daimyo collects taxes only from samurai, who, he expects, will in turn take from the lower castes, with whom he would rather not deal. Taxes are high, but not so high as to stifle further economic growth and all taxes are “regressive,” taking a higher percentage from those who have less. In this way, Hachiwara ensures sure that his samurai have a sense that if they but work harder, they can keep just a little more. Samurai patrol the province regularly, and swift retribution is brought to all who are even suspected of insubordination or rebellion. Even more dreaded are the daimyo's assassins and private enforcers. It is not unheard for relatives of a suspected traitor to awaken of a morning and discover that whilst they slept, their kin was tortured and slain in the night, the body being left for all to see, a grisly warning. The capital of Oniba, and the chief city of Yonshu is Tsue-jo, which is located in the midst of the Batteigawa, with some settlements on the northern shores of the same. Towering above the rest of the city, and with dungeons buried deep below as well, is the palace complex of Lord Hachiwara. The noble quarters of the city lie below the palace complex, and outside of this region are the businesses and homes of the rest of the populace. The city features a grand zaoist temple outside the palae, and a smaller, private zaoist temple in the palace. The city temple is the largest in all of Yonshu, and has a hundred priest and a hundred and forty trained soldier-monks. Hara is a large town on the east shore of the Kuwabara-gawa and the center of silk production on Yonshu. Besides the manufacture of silk cloth, Hara also serves as an inspection gateway for merchandise coming into the province from Gaijinaba. A large contigent of samurai is always stationed in Hara, and the town boasts a half-dozen storehouses and armories for the daimyo's soldiers. As in the region of the three brothers, so along the Kurotsuru-no-gawa, there are many small farming villages. While most of these are inhabited by peasants, the Byoudenchi samurai clan maintains three different villages, including the village ofHachikoyama, which has both the clan castle and the notable Kino Taisha, a shrine dedicated to one of the clan's great warriors. The clan protects the region from bandits, manages farms, and has, of late, began breeding horses, with the goal of achieving a larger breed suitable for both farm labor and carrying heavily armored warriors. In the forest west of the river valleys, there are many small henge villages hidden from the eyes of men. One of the oldest of these is Kitsumura. Built around an ancient fox statue, the isolated village has 200 henge of various clans. To the north is the slightly larger henge village of Aspertamu, which serves as a training ground for henge warriors and as a minor commercial hub for henge and tengu goods, especially copper from the north, iron from the mountains and silk from the south. There are a half a dozen tiny henge villages north of the Kuwabara-gawa, which having stolen silk worms from the human villages south of them, focus on silk production. These villages are ever alert for the presence of samurai, but two sibling wizards of the rat clan use magics to help keep humans from finding them. Without a doubt, Oniba is the most prosperous province in Genshu, comparing favorably with some of the more prosperous provinces of Anshu. It was not always thus. A hundred years previously, Oniba was still something of a backwater province,known chiefly for its exotic woods, but Lord Hachiwara has done much in recent years to improve the region, encouraging greater amounts of farming and financing silk farms in the region of Hara. Currently, more rice is grown in Oniba than in all of the other three provinces of Genshu combined, and Oniba rice, cultivated with a slightly rounder grain than rice grown elsewhere in Kaidan, is becoming quite popular in the imperial capital. Oniba silk is not quite so popular on Anshu, but it sells very well to the gaijin traders in Gaijinoshima, who buy over half of the silk manufactured in the province, readily trading steel and gold for the fabric. While the increase in economic wealth is only marginally felt by the peasant masses, the samurai families of Tsue-jo, and the province at large, are slowly amassing stockpiles of silk, rice and steel and the economic influence of these families continues to grow. Though it is only marginally a secret within the province, two of the leading samurai families of Genshu, the Kinhara and the Kumagawa, have each been siphoning steel and gold from the shipments passing through the region. The Kinhara oversee the traffic passing through Hara and are notoriously corrupt. The Kumagawa, who handle security and law enforcement in Tsue-jo, including handling oversight of the harbor, are only marginally better. Lord Hachiwara is aware of their thefts, but both families are very generous in their tribute to the daimyo and sometimes very useful to him, and so he abides their larceny without reporting it to the Shogun's officials. Hidden in the marshy swampland on the northeastern Oniba peninsula, is an evil castle called Nakikabejou. This castle is filled with oni, the largest collection of the demons on the island of Yonshu. Led by a Hebi-no-onna witch, the oni use the castle as a base of operations from which they conduct raids and plot great evil for the Kaidanese. While the daimyo knows of the castle's existence, the oni's magic's keep him from discerning its exact location. A hundred and seventy years ago, a bandit king named Ochoka waged war upon the forces of the daimyo, but was ultimately crushed. His castle, hidden in the northern woods of Oniba was rumored to be filled with great treasures, but it has never been found by the many would be treasure seekers that sought it. Recently, a peasant lad hunting boar came across the hidden entrance to Ochoka's lair and, upon entering, was possessed by the ghost of Ochoka. Now the bandit king, in his new body, is once more amassing followers with which to make war upon Lord Hachiwara. Oniba province contains one of the three sacred bamboo groves of the yokai (the other two being found in Ika and Unori provinces). The bamboo of the grove has stalks five to ten feet wide, towering hundreds of feet into the air. It is kept by a small cadre of henge priests, who kill any humans who attempt to settle near to the grove.